Retro 8-bit Super Mario Bros. Monopoly looks amazing and is now available — GamingWithSwag.com - Dads By Day, Gamers By Night. Sure it seems like there is a themed version for Monopoly for every license available these days. 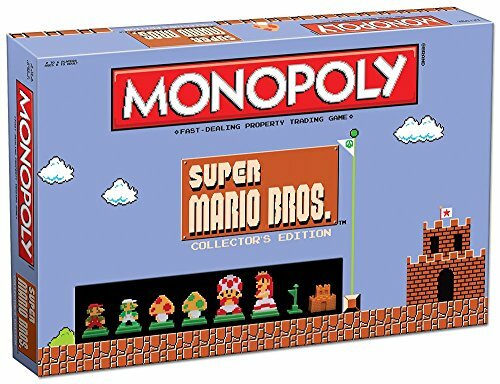 We have gotten several Nintendo-themed Monopoly variants over the years and a Legend of Zelda release as well. Today I am actually quite surprised to see a Monopoly game based on the original Super Mario Bros. in so much detail. The game seems to bare little resemblance to the original board, and has a beautiful retro theme. The tokens look awesome as well, featuring Mario, Luigi, Toad, and Princess Toadstool in all of their 8-bit glory. Being a huge retro gamer, this is the right was to utilize this retro license and art work. I love how all of the spaces are filled in with the appropriate backgrounds, and there is none of the original board game's background. I also think it's cool that the end flag poles replace the houses, and the castles replace the hotels. Overall it looks to be a really nice collector's piece, hopefully we can get our hands on one for a review and a play through video. Something tells me these won't be on shelves long. The Retro tokens in Super Mario Bros. Monopoly look amazing. Everything about this screams awesome.